Greetings, ‘Fetti Fans and welcome to DAY ONE of the September COUNTDOWN TO CONFETTI! This release is extra special with all of the new product lines being released! Well, ‘Fetti Fans, here it goes! You know the drill…sit back, enjoy that cuppa and all of the Confetti Creativity we have in store for you today! Cardstock – Premium 100lb cardstock that coordinates with our Confetti Colors Ink. We will be introducing 4-5 colors at a time. These will be available in 12 sheets of single color and 12 sheet multi-color sheet packs. Ink – Premium Dye Ink that coordinates with our Confetti Colors Cardstock. Available in full pads, re-inkers and 4 packs of ink cubes. Patterned Paper – Gorgeous, heavyweight 65lb patterned paper in 6×6 pads (no loose sheets!) featuring designs that coordinate with our cardstock and ink. Designed by in house artists with no stock images. Stencils – 6 x 6 plastic stencils to use on all of your paper crafting, mixed media and Bible journaling projects. You will see all of these fun new products in action from the Confetti Crew during the Countdown to Confetti this week and they will be available in store on September 8th. 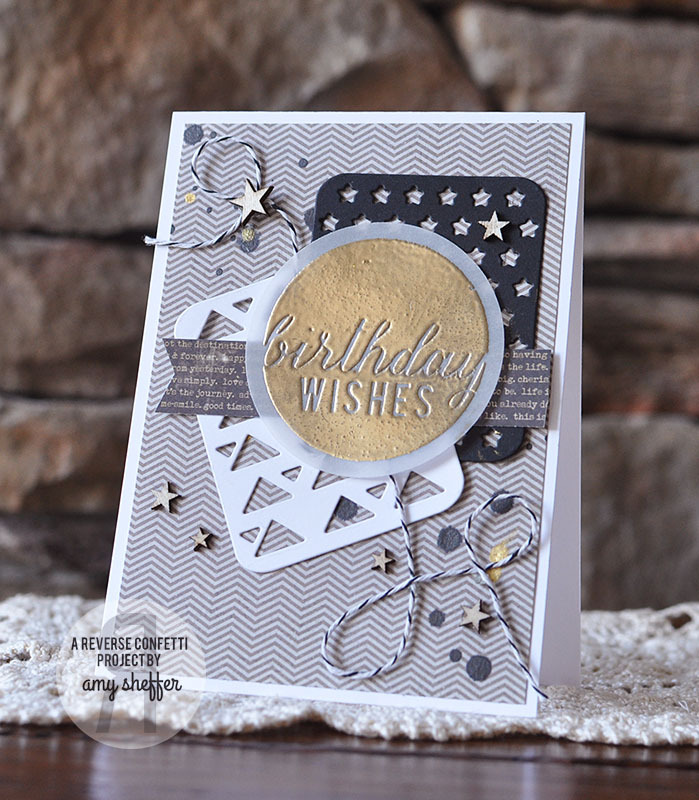 For the shaker portion of this card, I used the SHAKERS ‘N FRAMES Confetti Cuts die set. You may have seen my “secret tool” for making shaker cards on Instagram the other day. I’ll be doing a Facebook live post about that this week, too. The DOUBLE EDGE SCALLOP BORDER Confetti Cuts die was used to create the scalloped edge (from ICED AQUA cardstock). The WEB TAG LAYER Confetti Cuts die set is the latest addition to the Confetti Cuts that layer with the TOPPED OFF TAG Confetti Cuts die set. It’s hard to get spooked with a witch this cute! The GRAPE SODA tag was cut from the TOPPED OFF TAG Confetti Cuts and then layered with the new WEB TAG LAYER Confetti Cuts and topped off with the witch, cauldron and sentiment from the new BEST WITCHES stamp set. The tag is finished off with the pinked edge HANG UPS Confetti Cuts (to match the edge of her dress) along with a few green sequins. This card uses a variety of new products. The polka dot background was created with the new LOTSA DOTS stencil and glossy black embossing paste. Once that was dry, I layered the sentiment from the TREAT YO’ SELF stamp set (on a SCALLOPED CIRCLE Confetti Cuts) and bats from the HALLOWEEN BITS Confetti Cuts die set. I started off (again!) with the TOPPED OFF TAG Confetti Cuts die set and then stamped the “You’re so FAB-BOO-LOUS” sentiment (from the new TREAT YO’ SELF stamp set) in black. I added the sweet (or is he spooky?) ghost along with hangers from the HANG UPS, TOO Confetti Cuts die set in ICED AQUA, TANGERINE and (in my stash) black. As a finishing touch I added buttons tied off with the new CHARCOAL STRIPE twine. The Confetti Crew has been super busy creating with all the new goodies and I know they are excited to share their creations with you! Please note, the product descriptions will now be listed on each product page. Hello ‘Fetti Fans and welcome to the first annual HAPPY FALL-IDAYS! What exactly is HAPPY FALL-IDAYS? It’s an online showcase event where the Confetti Crew will be sharing multiple holiday projects (these go way beyond cards!) and providing a serious dose of Reverse Confetti and holiday inspiration! The fall and winter holidays are upon us now, so we are making this a 3 day celebration of Halloween, Thanksgiving and Christmas! As the graphic below would suggest, we are kicking off HAPPY FALL-IDAYS with HALLOWEEN today. Just below the graphic is a list of all of the Confetti Crew members that are sharing their projects today. Be sure to scroll past, as I have a little something to share with you, as well! I love paper crafting. I love memory keeping projects. I don’t love scrapbooking. Create paper crafting projects that contain pictures, making them memory keeping projects. Are you wondering what I am talking about? (Don’t worry, sometimes nobody knows). I created this triptych (geesh, it’s been a LONG time since I made one of these!) and embellished and added pictures of my lil’ ones from last year’s Halloween. Nic was a vampire (hence the un-living look) and Ellie was a pirate. The entire project measures 9″ x 5.5″, with folds on 3″ and 6″. The center panel is 3 pumpkins cut from the PUMPKIN PATCH Confetti Cuts die set that are each covered in orange glitter. Each of the pumpkins is popped up on a glue dot for some added dimension. In short, this is what I call memory keeping…a fun project that I can display year after year that contains picture of a fun family time. I’ll be on Periscope later today (I’ll post time on IG) going over this project, along with some of my other favorite un-scrapbooking projects, too. See you then! It’s DAY ONE of our sneak peeks, or as we like to call them…the COUNTDOWN TO CONFETTI! We are so excited to announce that our new release is just days away! You are going to love all the new products coming out…SIX new stamp sets, EIGHT Confetti Cuts die sets and all new *limited edition* Quick Card Panels! On Facebook, simply leave a comment under the graphic. One person that comments on the graphic by 1pm EST on SEPTEMBER 7th will be randomly chosen to win one a $15 gift certificate to the Reverse Confetti store. Winners for both the blog comments and Facebook comments will be announced here on the Reverse Confetti blog as well as on Facebook. If you recognize any of the patterns, it’s because we’re listening to you about what you love! We took some ‘Fetti Fan favorites and put a fall color twist on them. This four piece Confetti Cuts tag set features a tag base, rounded rectangle (to create frames, shakers and/or layers), as well as the word “THANKS” and a reinforcer circle. On this tag (created with new Fall Fun QUICK CARD PANELS! ), I used the rounded rectangle to cut out a window and create a frame from the polka dot panel. For the word “THANKS,” I cut out three and layered them on top of each other to create some depth. The balloons were borrowed from the previously released, MONKEY BUSINESS stamp set. And, YES!, all of these sets have complementing images that can be used with each other on purpose…it’s just more fun that way!! If you’ve been a blog reader of mine for a Halloween season, you *know* that I absolutely LOVE LOVE LOVE creating for Halloween! Needless to say, I’ve had a blast creating Halloween projects with this set. I just love that stripey tissue paper…perfect for Halloween and the TASSEL Confetti Cuts die! This Confetti Cuts die set features two scallop borders: one solid, one outline. I’ve attached these tags to Little Debbie Apple Pies. These are the perfect size…and are quite yummy heated up with a little ice cream (just sayin’). And, at about $3 for a pack of 8, it was hard to beat! Great lil’ gifties! Got Pie? The Easy As Pie stamp set features mixed-font sentiments that pair with the Easy As Pie Confetti Cuts set or can be used stand-alone on cards and tags. The two-piece Easy As Pie Confetti Cuts set creates a pie die cut to embellish your fall and holiday themed tags, cards, scrapbook pages or home décor projects. Use stand-alone or with the coordinating Easy As Pie sentiment stamp set. Say thanks with the four-piece Thanks Tag Confetti Cuts set that includes scallop-edge tag, “thanks” sentiment, rounded-corner rectangle (for layering or to create a shaker or frame), and tag hole reinforcement. Use the pieces together or with other stamp sets and/or Confetti Cuts on your paper crafting projects. Use the Too Cute To Spook Confetti Cuts die set paired with the Too Cute to Spook stamp set for totally cute, and not too spooky projects. No matter what the season, the stand-alone Double Scallop Garland Confetti Cuts set will add fun to your paper crafting projects! The set includes a solid garland and an outline one. Use together or alone for added detail and dimension on your paper crafting projects. Just a quick reminder that there are just a few more days to play along with this month’s SKETCH FOR YOU TO TRY! Of course, we have some more great inspiration for you, as well! Click HERE to add your SFYTT creation for a chance to win! It’s time for WEEK IN REVERSE where we take a peek back at what some of the Confetti Crew has been up to this week! Prepare to be inspired! Laurie is also on Confetti Camera this week. Be sure to take a peek at yesterday’s post for some FABULOUSLY FUN fall inspired gifties! Do you have your badge? Get it HERE. The weekend is in view! Do you have anything fun planned? We are having a get together with another family for some Halloween fun. I’m looking forward to preparing/eating Halloween themed foods and letting the kids make Zombie Goo (slime). I’ll post pics of the good times next week. Any other pics you want to see?…like, maybe a super duper sneak peek of the November release? Hmmm… (wink). I love Thursdays here on the Reverse Confetti blog! Why? Because it’s time for CONFETTI CAMERA! 3) For this round we have been focusing on ABC (anything but a card) project. Prepare to be inspired! Hi Confetti fans! Laurie here to share a couple of fun Fall ABC Projects (Anything But a Card/Tag)! Having a lot of kids means having a lot of cards and gifts to give around the Holidays! With Halloween and Thanksgiving approaching quickly, I thought I had better get started on those! Two of my sons go to a small rural school which has only a handful of students in it. I like to give out small gifts this time of year, but because I still have a toddler to tend to, I need something that I can mass produce in a short amount of time. This first box is one that I will be making for Halloween. I started by stamping the fence image (from the SPOOKY CUTIES set) onto the acetate box using Black Stazon ink. A tip that I have found to help me when stamping on very slippery surfaces is to make sure I hold the stamp straight over the surface (not at an angle). I added the cute ghostie to the front of the box, popping him up so that he appears to be floating. 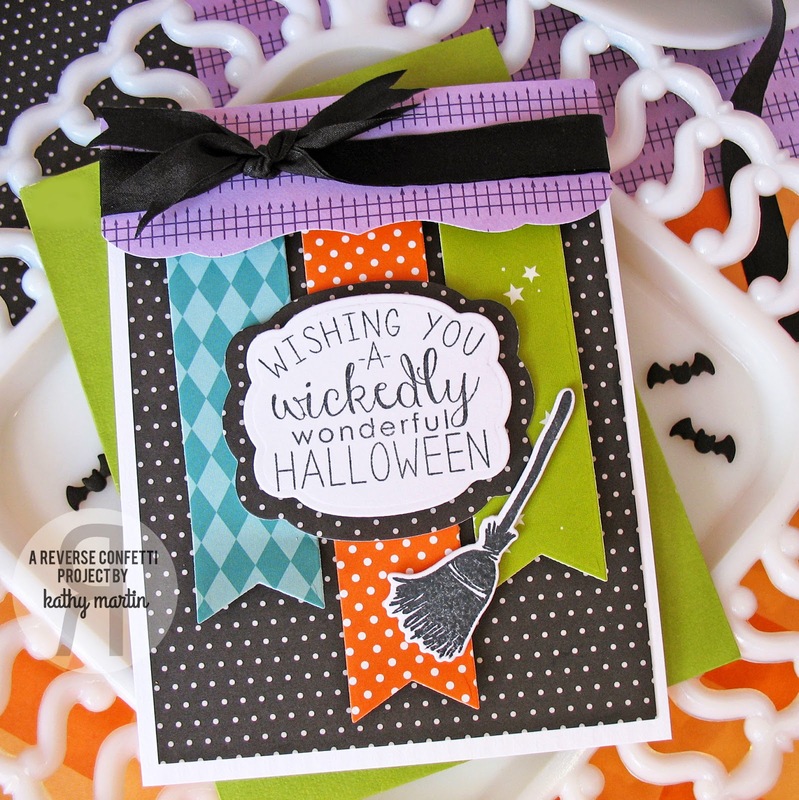 I stamped the sentiment (from the SPOOKY SENTIMENTS set) using Black Stazon ink. My next box is one that I will be giving to my sons’ teachers for Thanksgiving. I started by using the TREAT TOTE Confetti Cuts die to create the treat box. To decorate the front, I stamped the woodgrain image (from the FOREVER FALL set) onto strips of matching cardstock and then sponged the edges a bit with a dark ink. The label was created by stamping the sentiment from the Give Thanks stamp set and cutting it outusing the coordinating GIVE THANKS LABEL Confetti Cuts die set. I filled the box with a clear bag of mixed roasted nuts. I also might add some homemade candied almonds…mmmmm! I hope this has inspired you to come up with an easy to mass produce gift item! They don’t need to take a lot of time to be super cute and heartfelt!